Alma the Younger and the sons of Mosiah were introduced as having been “a great hinderment to the prosperity of the church of God” during the reign of Mosiah. Like Saul of Tarsus before his conversion (Acts 9), they persecuted members of the church and actively sought to destroy it. They were said to be responsible for “stealing away the hearts of the people; causing much dissension among the people; giving a chance for the enemy of God to exercise his power over them” (Mosiah 27:9). This suddenly changed when Alma and the sons of the Mosiah, in the course of their “rebelling against God,” encountered an angel of the Lord. The scripture says that the angel “descended as it were in a cloud; and he spake as it were with a voice of thunder, which caused the earth to shake upon which they stood” (Mosiah 27:11). This resulted in so great an “astonishment” on their part that Alma and the sons of Mosiah “fell to the earth, and understood not the words which he spake unto them” (Mosiah 27:12). 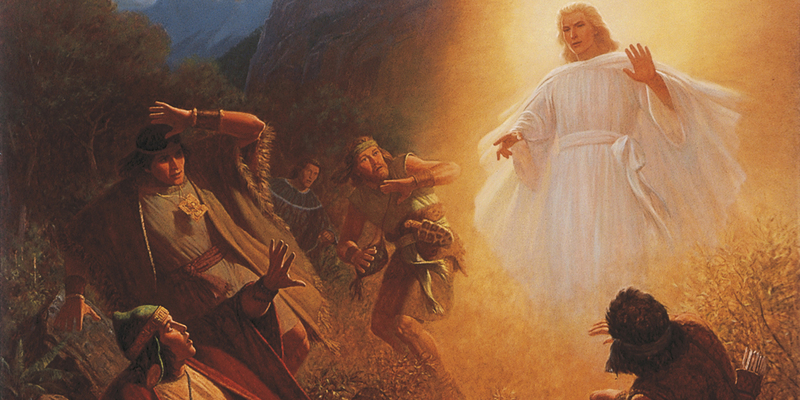 This dramatic hierophany (manifestation of the divine) concluded with Alma being struck dumb, “for with [his] own eyes [he] had beheld an angel of the Lord; and his voice was as thunder, which shook the earth” (Mosiah 27:18–19). In the Hebrew Bible the God of Israel, Jehovah, absorbed some of the attributes and epithets of the storm god Baal. Psalm 68 praises Jehovah as “him who rides upon the clouds” (Psalm 68:4), an epithet shared by Baal in the mythology of the ancient Canaanite city Ugarit. In Psalm 65 Jehovah is portrayed as a God of fertility, livestock, and rejuvenation, again consistent with Canaanite depictions of Baal (Psalm 65:9–13). David G. Burke explained that the authors of the Hebrew Bible wanted to depict Yahweh, not Baal, as ruling the cosmos, and as “the one who rode the clouds, controlled the storms, and brought freshening rains” to earth. As they traveled through the Sinai wilderness, Jehovah revealed himself (a concept that scholars call a theophany) in a cloud or pillar of fire on multiple occasions to the children of Israel. During one such theophany at Sinai “there were thunders and lightnings, and a thick cloud upon the mount, and the voice of the trumpet exceeding loud; so that all the people that was in the camp trembled” (Exodus 19:16). This functioned as a display of Jehovah’s power, both over Israel’s foes (cf. Exodus 14:24) and the very forces of nature. It was intended to depict him as a divine warrior worthy of an awestruck Israel’s unfeigned devotion and loyalty. As Wright explained, “Lightning had far different connotations in the New World, specifically in Mesoamerica” than it did in the ancient Near East. While still associated with the manifestation of divine power, “in Mesoamerica lightning was associated with fertility and regeneration, even resurrection,” and not with violent, destructive forces in the hands of a warrior deity. Wright continued, “A central tenet of ancient Maya theology was that the maize god died, was buried, and was resurrected when lightning cracked open the surface of the earth, which was variously conceptualized as a mountain, a rock, or even a giant turtle carapace.” This association between lightning and the dying-resurrecting maize deity would have been significant for Alma, who would later explain that while in his stupor he found salvation in the dying-resurrecting Jesus Christ (Mosiah 27:23–31; Alma 36:12–23). From an ancient Near Eastern or biblical perspective, then, the voice of the angel being as thunder could be understood as a manifestation of the terrifying power of the storm god or divine warrior. From a Mesoamerican perspective, the voice of the angel being as thunder could be understood as associating the angel with the dying-resurrecting maize god, whom the Nephites worshipped in the form of Jesus Christ. Understanding this illuminates why the angel spoke in a voice that sounded like thunder. Essentially, the angel wanted to shake up Alma and stop him in his tracks. He spoke like thunder so that Alma would know that this heavenly messenger spoke with divine power and authority. This hierophany forced Alma to recognize that if he continued in his course he would himself be cast off and destroyed in divine judgment (Mosiah 27:16; Alma 36:9, 11). The thunder and the accompanying lightning also symbolized regeneration and resurrection, which Alma would have recognized. He later spoke about being “born of God” (Alma 36:23, 24, 26) through this experience; resurrected to a new life, as it were. The angel thus left an indelible impression on the young man. The thunder was unforgettable, impressed his soul, and transformed his life. Mark Alan Wright, “Nephite Daykeepers: Ritual Specialists in Mesoamerica and the Book of Mormon,” in Ancient Temple Worship: Proceedings of the Expound Symposium, 14 May 2011, Temple on Mount Zion Series 1, ed. Matthew B. Brown, Jeffrey M. Bradshaw, Stephen D. Ricks, and John S. Thompson (Salt Lake City and Orem, UT: Eborn Books and the Interpreter Foundation, 2014), 247–252. Mark Alan Wright, “‘According to Their Language, unto Their Understanding’: The Cultural Context of Hierophanies and Theophanies in Latter-day Saint Canon,” Studies in the Bible and Antiquity 3 (2011): 51–65. Mark Alan Wright, “‘According to Their Language, unto Their Understanding’: The Cultural Context of Hierophanies and Theophanies in Latter-day Saint Canon,” Studies in the Bible and Antiquity 3 (2011): 53. David G. Burke, “Baal,” in The Oxford Companion to the Bible, ed. Bruce M. Metzger and Michael D. Coogan (New York, NY: Oxford University Press, 1993), 70. See, e.g., Exodus 13:21–22; 14:19–20, 24; 16:10; 19:9; 24:15; 40:34–38; Numbers 9:15–22; 12:5; 14:14. M. L. Barré, “Lightning,” in Dictionary of Deities and Demons in the Bible, ed. Karel van der Toorn, Bob Becking, and Pieter W. van der Horst, 2nd ed. (Leiden: Brill, 1999), 519–520. Wright, “‘According to Their Language, unto Their Understanding’,” 54. Wright, “‘According to Their Language, unto Their Understanding’,” 55. Wright, “‘According to Their Language, unto Their Understanding’,” 51–52.